Non-verified -Besen International Group (Nanjing) Trading Co., Ltd. Description:Product Specification Model: BS-CHC007-5MS Standard: Type 1 plug to male plug Certificate: TUV, CE IP Degree: IP67 Current: 16A Power: 3.6kw Length: 5m (16.4ft) Color: Black/Blue/Orange/Green or customized Cable: Coiled Key festures -Standard Connector. 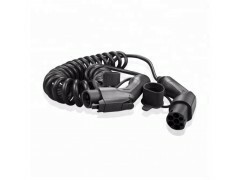 Can be identified by EV (with Type 1 inlet) correctly and charge effectively. -Rugged design. Its structural strength is sufficient enough to support the rolling of an electric car. -Unique Arc Extinguishing technique makes sure that there won’t have any electric sparks when plugging in and plugging out. -Safe & Reliable. The cable is made of flame-retardant TPE (TPU) material, which can withstand the direct fire combustion within a safe time. -Durable. The advanced Crimping Technology ensures a working life of over 50,000 times safe plugging in or out without any off-line error.